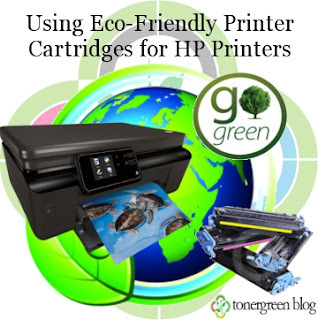 Using Eco-Friendly Printer Cartridges for HP Printers | TonerGreen - Eco-Friendly Toners from the U.S.
Hewlett Packard is an American multinational company known for manufacturing printing machines and devices for both home and office users. They are both considered as one of the best printer brands in the line of laser printers and inkjet printers. But aside from producing rich-featured printers, HP printers also made it on the list of the Top 10 Best Global Green Brands for this year along with Panasonic and Dell. Different brands were judged on a wide range of criteria including environmental programs, performance in measuring reporting and mitigating the environmental performance of their supply chain, the green attributes of the company's products and of course, sustainability. HP was one of those brands that were included. This was because HP printers are not only packed with advanced functions; they are also built with eco-friendly features. Aside from being Energy-Qualified products, these printers include energy-saving mode, toner-saving option and auto-duplex printing setting. These features are what make it more popular for users who want to buy a printing machine that can contribute to energy conservation, sustainability, and environmental responsibility. But if you already own an HP printer in your home or at your office and still want to contribute more in helping the environment then buy eco-friendly printer consumables. These environmental-friendly printer consumables are technically called remanufactured toner cartridges and remanufactured inkjet cartridges. Third-party companies re-manufacture used-OEM HP cartridges to be repacked and re-sale again to consumers. TonerGreen is one of those trusted online provider of quality eco-friendly printer cartridges that covers almost all HP printers. All our remanufactured toner cartridges and remanufactured inkjet cartridges that are made in the U.S. Our products are not just ordinary recycled toner or recycled cartridges, and is just a small part of the extensive remanufacturing process that our product undergoes at our in-house facility. Quality is strictly imposed every step of the remanufacturing process until our products are either picked up by customers or shipped to their address. Moreover, with TonerGreen products, you can save as much as 60% and help save our planet at the same time. Our in-house manufacturing facility ensures that our remanufactured HP printer cartridges are of excellent quality to match OEM standards. 100% Guaranteed. Nice post with great info and details. I need a Plastic cards printing machine, where i can get the best one?